With Valentine's Day this year falling on a Friday it's the perfect opportunity to book a surprise break away. Coinciding with February half term for many schools, you may wish to combine your holiday to provide something perfect for the whole family. We can offer you more than 70 which we feel are romantic. Whether they are cosy little get-a-ways, or have dramatic views, or just offer that extra little something. Our list is by no means definitive so if nothing grabs your eye you can choose properties based on location or facilities on our website at anytime. These properties offer a low occupancy discount for using just the one bedroom in larger properties. This is often an excellent way to treat yourself (or your loved one) to a little extra at a reduced rate. Some of our much larger properties offer discounts for up to 4 people in two bedrooms, so worth having a look even if you're bring the little ones. If you're looking to truly impress then take a look at these. Many of our luxury properties still come at a perfectly affordable rate, and others are well worth the extra pennies. From properties with unrivalled views from which to sit and drink champagne, to those with private hot tubs or swimming pools. There are many local businesses who can supply local flowers, here are two who grow and sell their own products: Tregothnan, specialise in sourcing local flowers and mixing with their own foliage. Fentongollan Farm, grow locally bred daffodils and can post simple splashes of colour to fill several vases! Do please note you must be present to received deliveries at your cottage, and we can't guarantee what sort of vases any cottage may provide. Best to take your own just in case! If you're looking for a Michelin star then the best place to eat out is the Driftwood Hotel in Portscatho (booking early highly advisable). 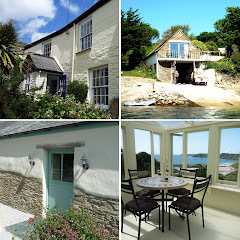 The Idle Rocks in St Mawes is newly refurbished and offers that extra something. For more of a Bistro style menu, Sam's in the City has recently opened in Truro and we had just the best Christmas lunch here so can thoroughly recommend. Rick Stein can offer you a very fishy menu in Padstow and Jamie Oliver is cooking up a school in Watergate Bay. For more information on places to eat and things to do visit our Holidays in Cornwall page on our website.